What could be better than a colorful bouquet of festive balloons? Francine inked up the Party Balloons and Heart Balloons stamp sets to concoct this festive design. How awesome is her use of the Hello There Die-namics? 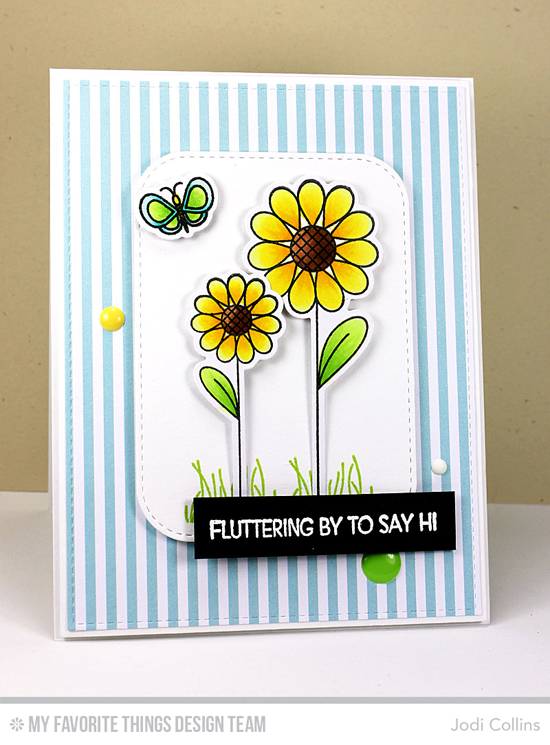 Pretty flowers and butterflies set in sweet soft grass take center stage on Jodi's darling design. The striped patterned paper for the Rainbow Stripes Paper Pack is the perfect match for the blue in our color combination. This card is simply a breath of fresh spring air! 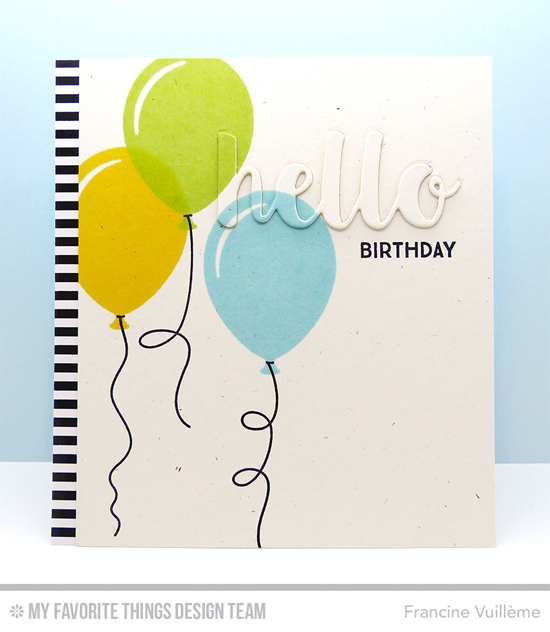 Our brand new Stitched Strip Die-namics is an awesome avenue for adding an array of colors to a card. 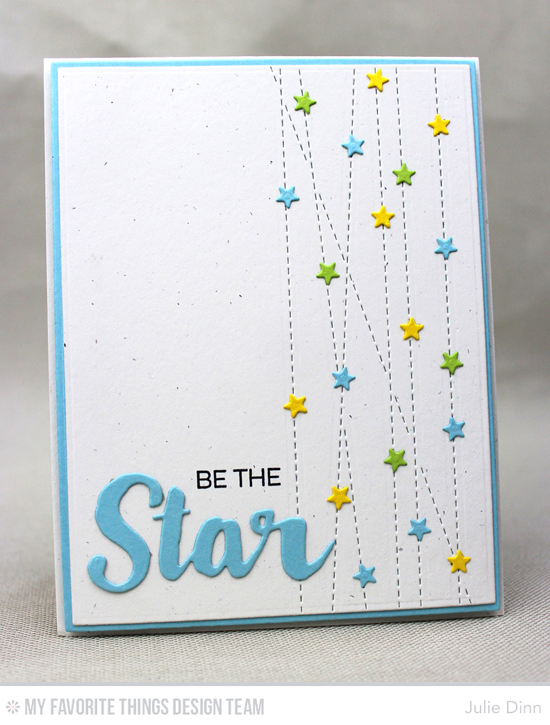 Julie's constellation of stars placed along the stitched lines work perfectly with the Count the Stars stamp set and Stars & Wishes Die-namics. The Peek-a-Boo Wonky Windows Die-namics frames a cute kitty from the Cool Cat stamp set nestled among some pretty flowers from the Build-able Bouquet stamp set. These colors are perfect for making super cute designs like this one from Inge. 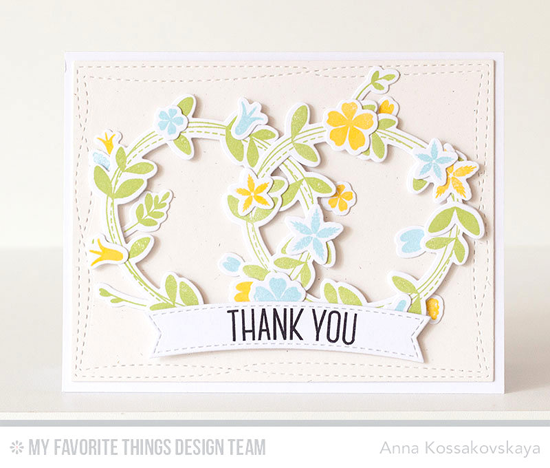 Two soft spring wreaths intertwine on Anna's lovely design incorporating the colors of Color Challenge 43. The Spring Wreath stamp set offers so many options for color — all you need to do is switch up your inks to achieve a different look! Congratulations, Margo S.! You are the randomly selected winner of the MFT Color Challenge. You can view all the entries from the last challenge HERE. You have until Wednesday, April 27th, at noon EDT to add your link and be eligible for the prize of up to $20 in MFT Cash. Winners are chosen at random, so everyone has a chance! The prize is a $15 Gift Voucher to My Favorite Things, but if you use MFT stamps and/or dies in your project, you’ll receive an extra $5. now if only the primitive white cardstock would come back in stock!